Run by artist Dale Copeland. The fifth, and last, edition. As good as I can make it. With all the suggestions for improvement faithfully executed. A 166-page A5-sized booklet, a full analysis of the patterns of ITF Taekwon-Do. From the Fundamental Movements to Tong-Il. e.g. Side piercing kicks ... in what patterns, at what heights, with what hand positions. When are fast, slow, continous, consecutive and connecting motion used? When are two movements listed as one? 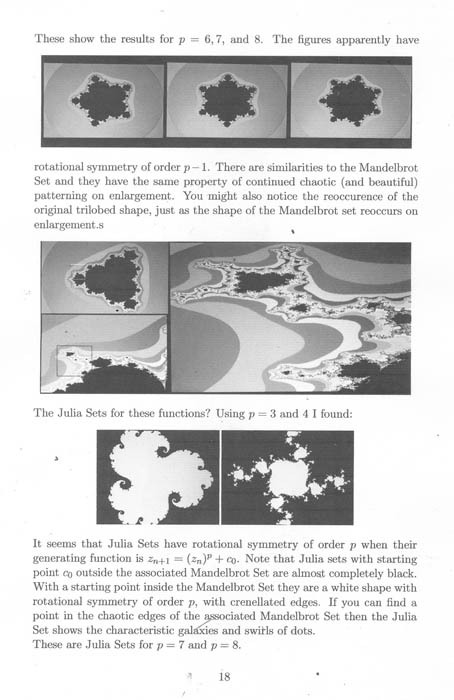 In which direction is the first foot movement of each pattern? What about returning to the ready position? Hints for getting back to the starting spot? A very useful reference book. On good quality 150gms paper, with 300gsm glossy covers. Price $40 plus postage .... $3.50 for New Zealand, $9 to Australia, $16 rest of the world. email me at dale @ tart.co.nz (remove spaces) if you'd like a copy. The cover and a couple of pages. Click on image for a closer look. 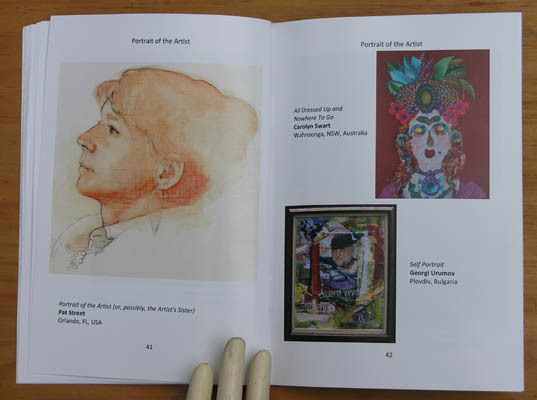 112 pages, Full-colour illustrations on good glossy stock. A5 size. 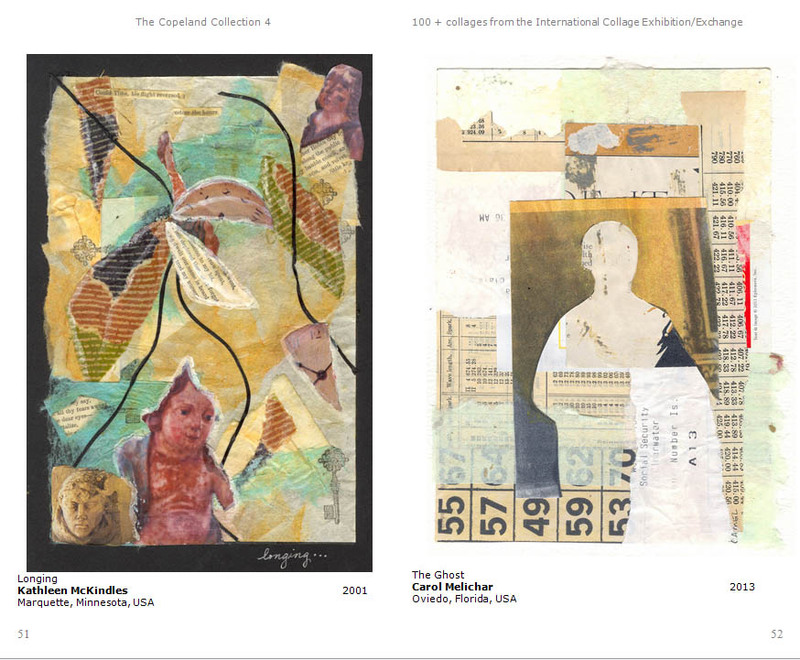 100+ collages collected from the International collage Exhibition/Exchange. 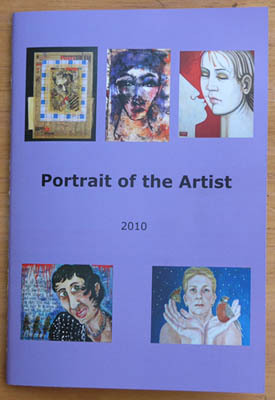 Click here to see a list of artists in this book. I made a big mistake, thinking that a single book can post at letter rate. They're too heavy. I'll carry my mistake for the ones already posted, but I've had to change the prices to carry the PROPER postage. Sigh. Dale Copeland, 7266 Surf Highway, RD 37 New Plymouth 4381, New Zealand. 67 full-colour illustrations on good glossy stock. A5 size. 37 artists from around the world responded to the challenge of creating WordART. $20 $3 New Zealand, $3.50 Australia, $4 for the rest of the world. (By light, tight packing, the postage rate is calculated at letter rate instead of as a parcel, YAY! (For those who have asked, PayPal to same e-address. 112 pages, 100 full-colour illustrations on good glossy stock. A5 size. My assemblage artwork accompanied by a not-quite-random walk around philosophy and poetry and humour. Life and death and the bits in between. The cover and a few sample pages. Now just $15 plus postage. Just email me at dale @ tart.co.nz (remove spaces) if you'd like a copy. 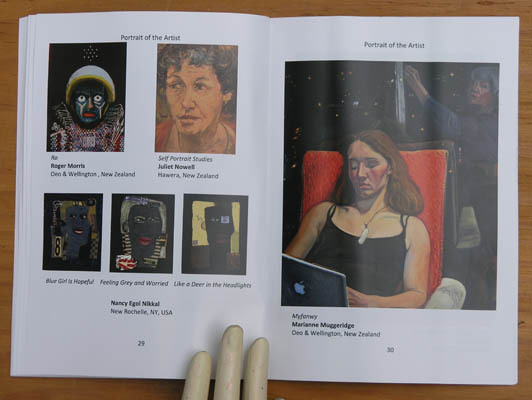 You can see the names of the artists whose work I've put in Volume 3 by clicking here. I'm really pleased with these. The cover and a few sample pages. Click on image for larger view. Now just $15 plus postage - $3.50 for New Zealand, $10 to Australia, $17 rest of the world. 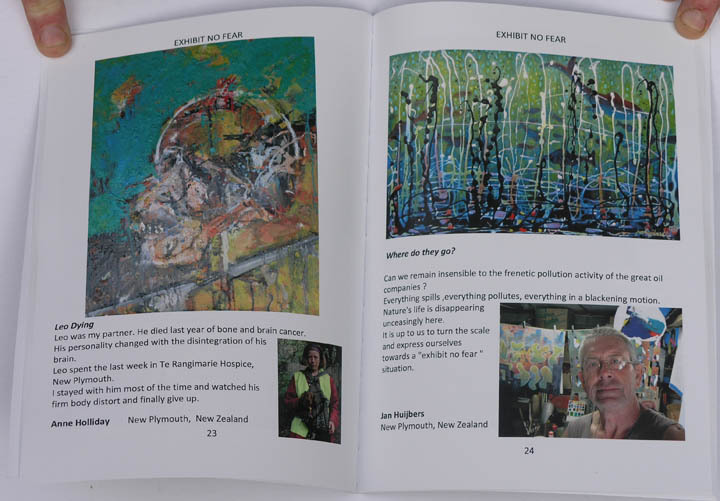 You can see the names of the artists whose work I've put in Volume 2 by clicking here. The cover and an open page. Click on image for larger view. Selecting the images was difficult - only 100 from my collection of 250. 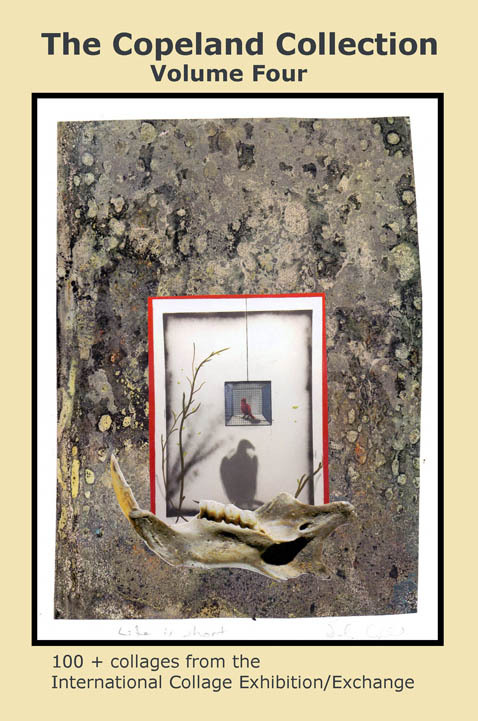 I had to leave out a lot of very fine collage art, by good artists and by good friends. The final selection was as much about which images looked good together as which were wonderful alone. I've been fretting so much about the great collages which I've left out that I'm working on another book to show more of the collection! 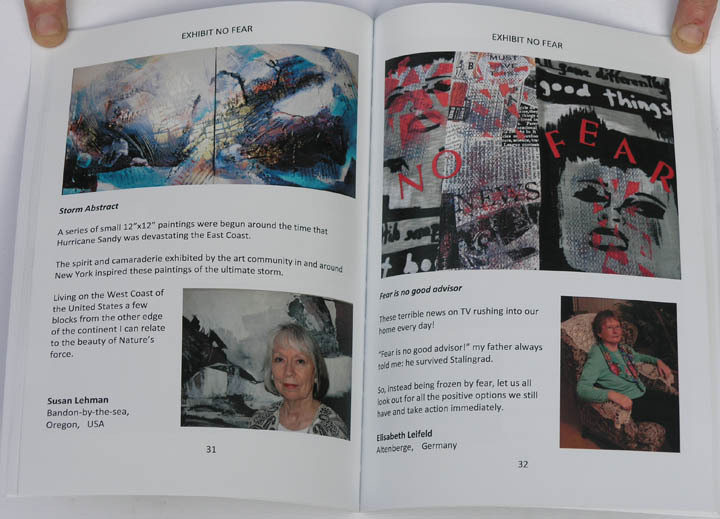 You can see the names of the artists whose work I've put in Volume 1 by clicking here. 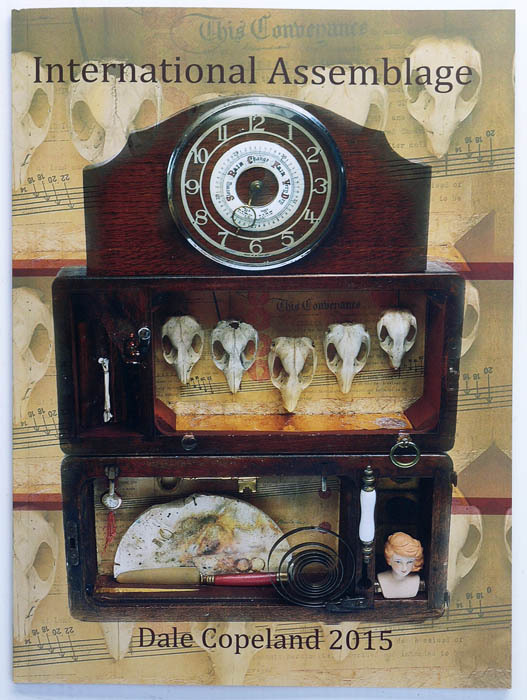 Assemblage artwork by 26 invited artists from around the world. 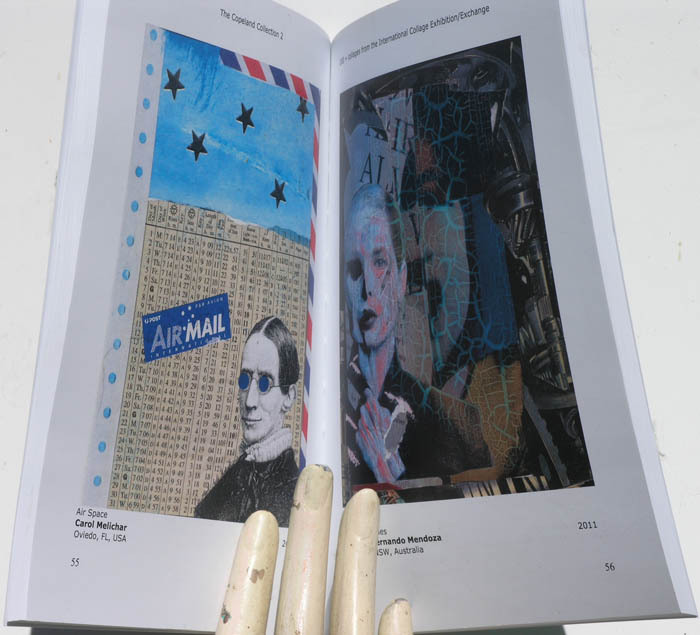 held in New Zealand to celebrate the centenary of Joseph Cornell's birth. $35 plus postage .... $3 for New Zealand, $9 to Australia, $13 rest of the world. 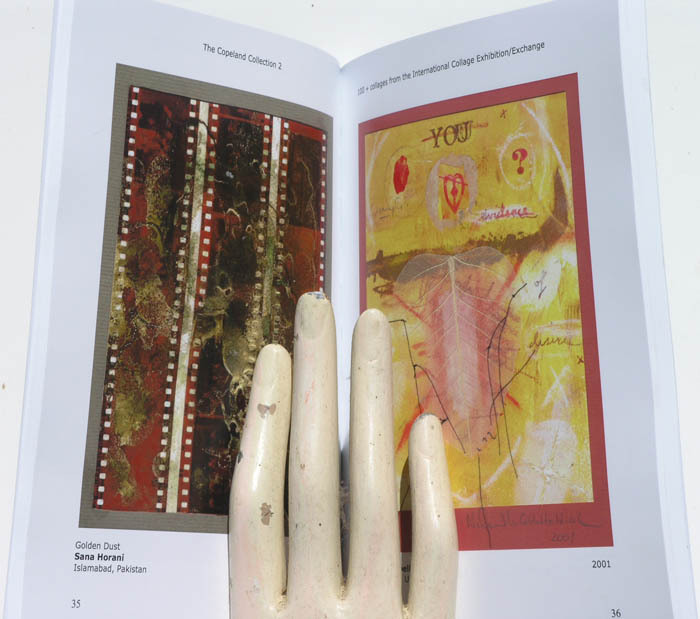 Click here to see details of this book, and of the exhibition. 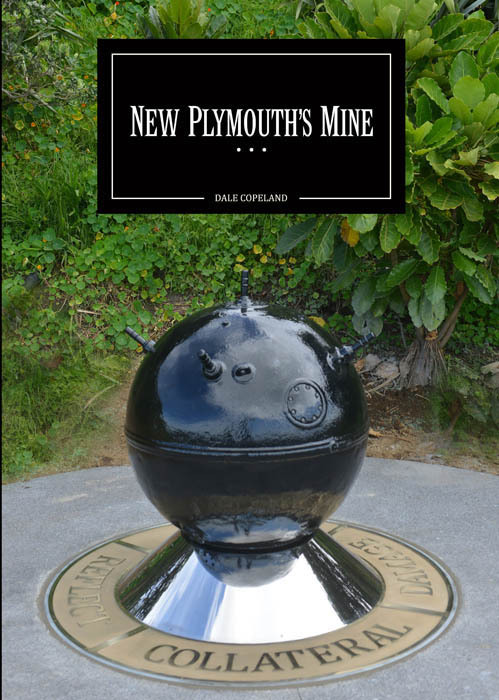 The history of the naval mine which washed onto the rocks at New Plymouth in 1943. Now a sculpture (designed by Dale) on New Plymouth's Coastal Walkway. The memories of the men in the New Plymouth Bomb Disposal Squad of 1942/3. Kindly supplied by their families. Poster for Philosophy of the Found exhibition Neo Jumbo handbound book. click on either image to see more detail, then 'return' to come back. Philosophy of the Found poster. Do you remember when artists would always print their posters and their invitations? Before everyone had access to a personal computer and printer. Art-lovers would collect them and have a collection pinned on a wall in their house. Lovely to visit. They've now become rare, and collector's items. So this is either a treasure, a historic document, or an example of daft stupidity, but fun. (with old lead letters and winding through my printing press). 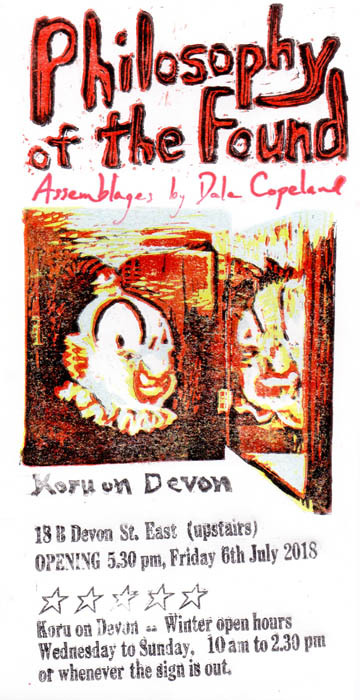 There's also a rubber stamp with the 'Assemblages by Dale Copeland' part. A long process and it took DAYS, but ooh it was fun. I'm pinning some around town, but I've chosen the best ones, signed them, and am offering them for sale. For $10 each, but less if you're another impoverished artist. 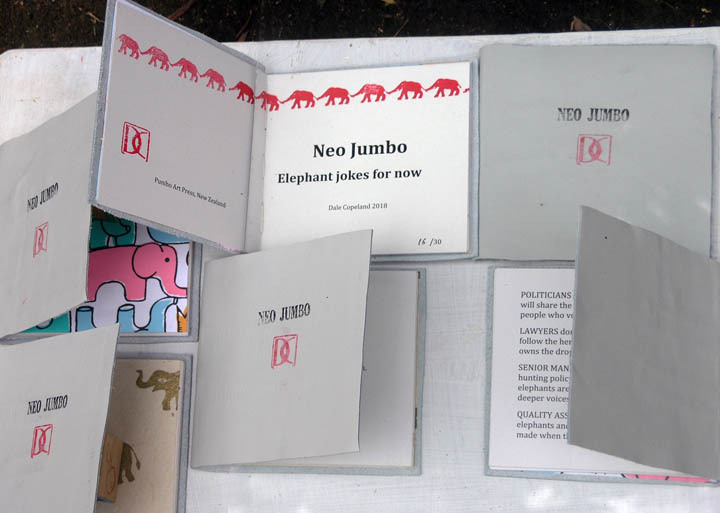 A hand-bound book, with soft grey leather cover and elephant-themed endpapers. and for those who have grown cynical but can still laugh at the bureaucracies. The book starts with the best of the weird old elephant jokes, and slides into a mocking cynicism. $25 each, which includes postage. From beginning to end, complete instructions for traditional binding. 5th edition, revised and expanded. I used to sell these either as handbound books or as kitsets for binding yourself. Now, finally, I've done the sensible thing and had the book printed as an affordable and useful handbook of instruction. A5 size, $5 plus postage. An exhibition of 50 self portraits painted over 40 years, between 1974 and 2014. 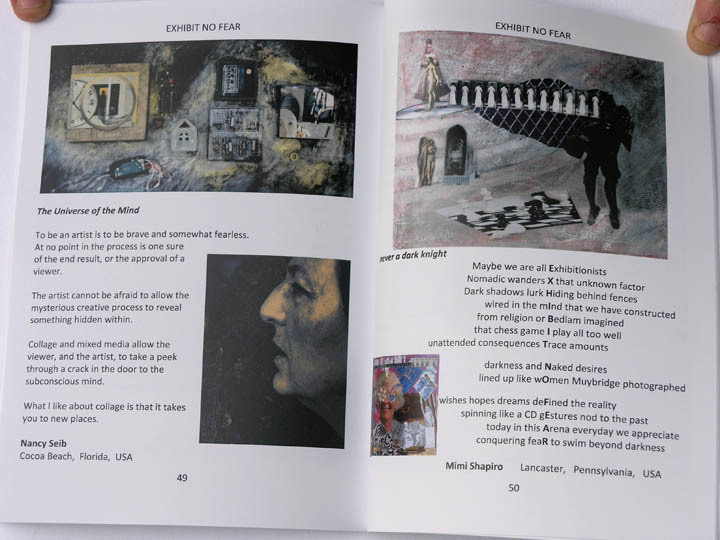 Paul's words which accompany each of the paintings tell not only about the work but his state of mind when he was painting. I hope that anyone familiar with the numerous self portraits I have made over the last four decades will not assume I am merely an overly narcissistic individual. If anything, what comes across to me now looking back at this body of work is the self-doubt and sometimes downright self-loathing inherent in the images. I guess in a more positive light, what I also see is a constant exploration and enquiry into, not just my own psyche, but different forms of expression, using the medium of paint, and a gradual and hard-won improvement and development in my facility. I have always had a strong liking for the self portrait genre. I enjoy looking at self portraits of all kinds, that have been made by all sorts of human beings, from the images of hands on prehistoric cave walls, or sophisticated self portraits made by famous artists of the past and present, to children's self depictions, or the nowadays ubiquitous "selfie" snapped on a phone. It seems to me that the self portrait is still the most honest and direct way we have for expressing and communicating just what it is to be human." Prepared as a thesis for my 5th Dan grading in September this year. A5 size, $6 plus postage. The venture, the artists, our methods of raising funds to make it happen. 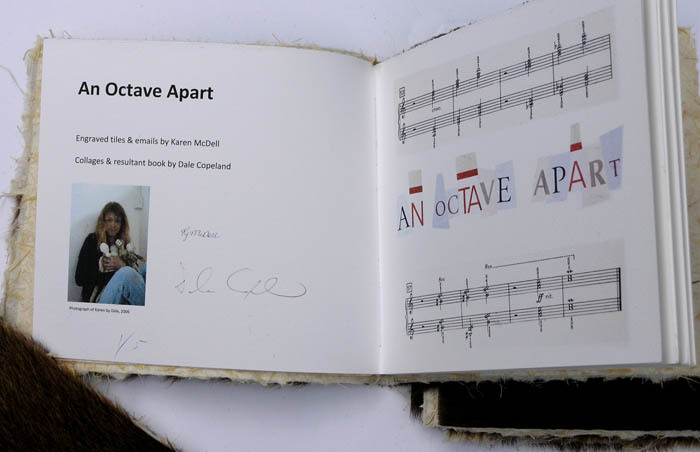 Poem by Louis MacNeice, 14 prints of collages by Dale Copeland. MacNeice described this 1938 poem as 'on the surface, a nonsense poem, sounding like bagpipes'. It describes the cultural decline of Scotland in the 1930s. It has come to have a wider relevance, the futility of effort, an anthem of depression. printed on 300gsm watercolour paper, endpapers of harakeke paper. Poem by TS Eliot, 12 images by Roger Morris. 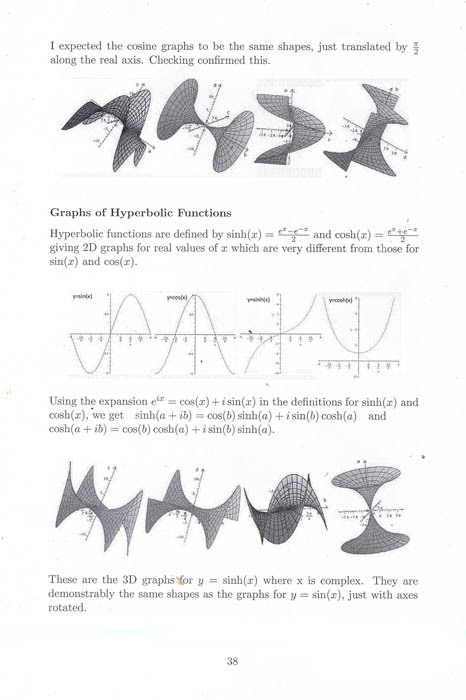 Second edition of 5 copies. Handbound in harder leather, printed on 300gsm watercolour paper, endpapers of harakeke paper. It may seem strange, after all the books on art (or Taekwon-Do), but I've been working on this other passion of mine for YEARS. 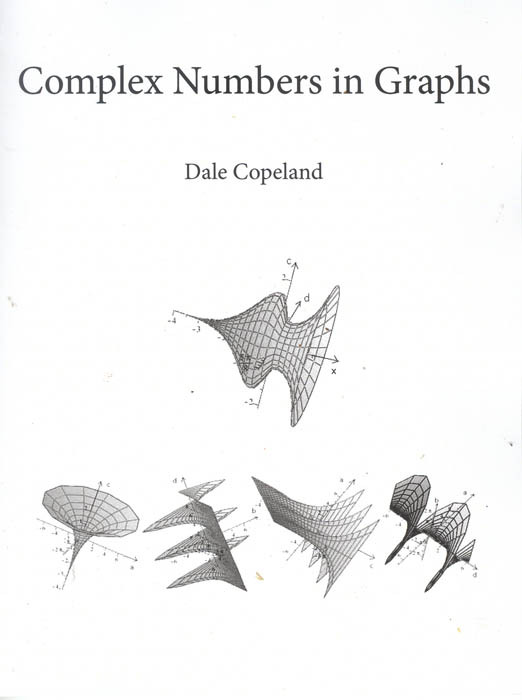 Designed for college students & undergraduates, anyone who finds Complex Numbers more interesting than just another maths topic. I've discovered such beautiful things! 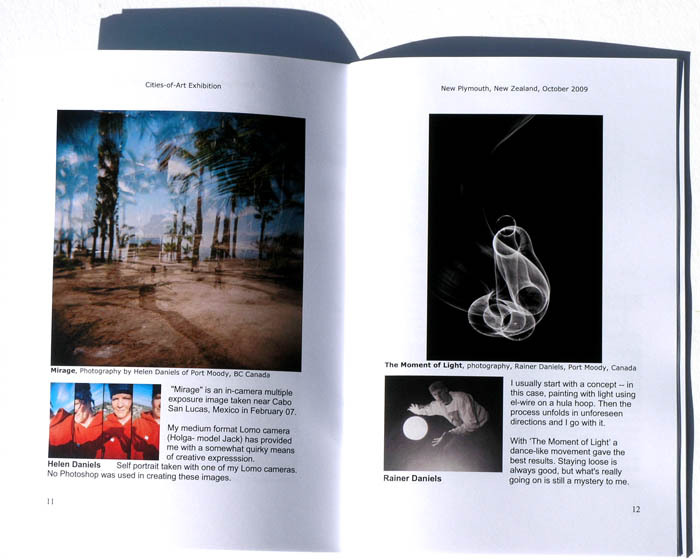 53 pages, b/w on good glossy stock. Crown Quarto size (that's a little smaller than A4). $20 plus postage - $3.50 for New Zealand, $7 for the rest of the world. I've only had 50 printed. holding the book open while I took some fast snaps while there was still some light in the day). 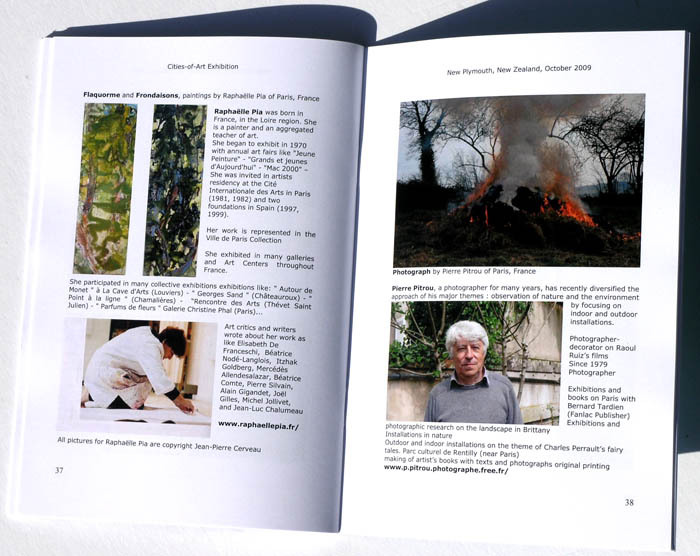 60 pages, Full-colour illustrations on good glossy stock. A5 size. 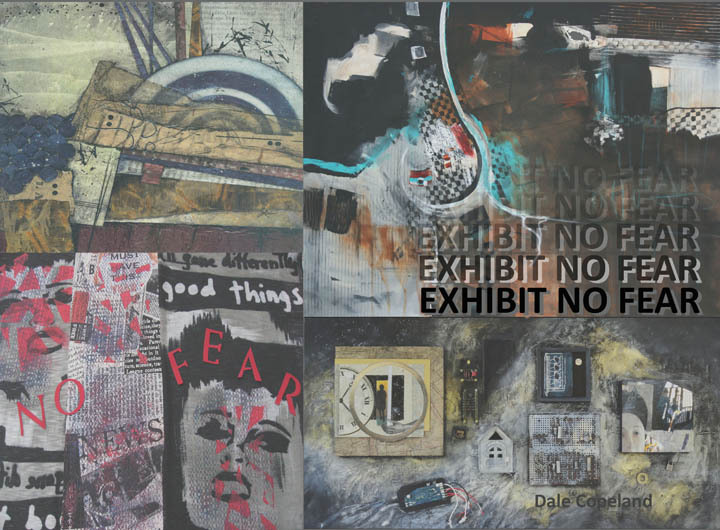 Images from the EXHIBIT NO FEAR exhibition. Work from 56 artists, from 9 different countries. 116 portraits, by 76 artists from around the world. 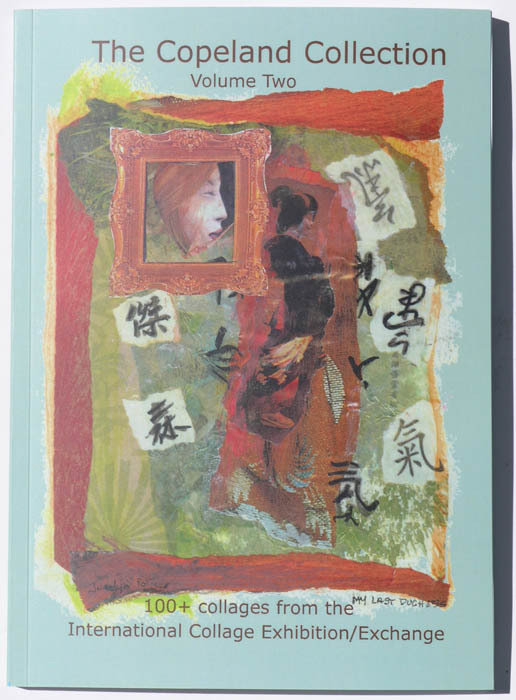 116 full-colour illustrations on good glossy stock. A5 size. 108 pages, 110 full-colour illustrations on high quality glossy stock. A5 size. 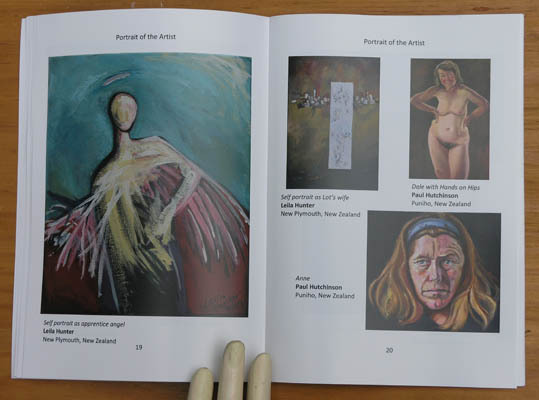 Art and artists from Taranaki, New Zealand. 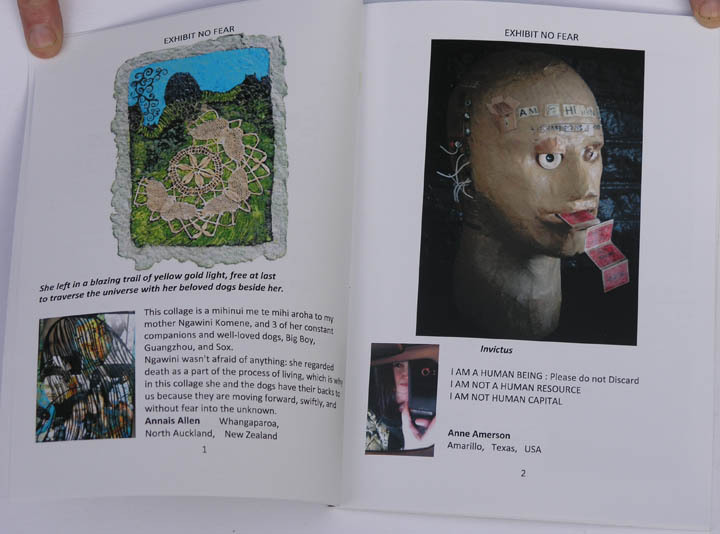 53 artists who currently show their work on the Virtual Tart website. 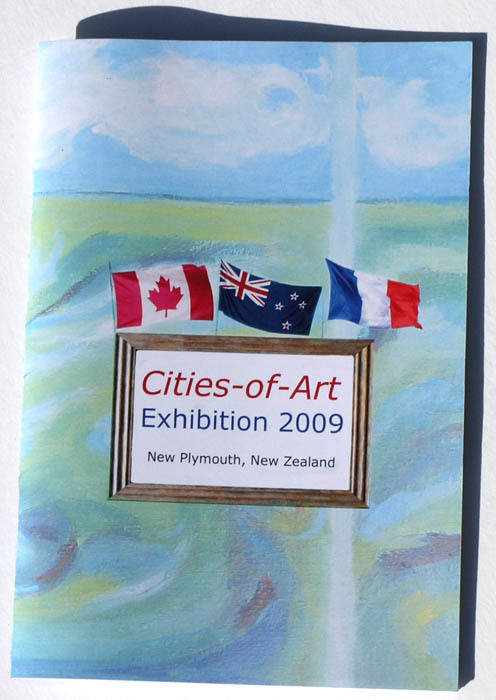 The illustrated catalogue for the 2009 Cities-of-Art exhibition shows 50 artists from France, Canada and New Zealand. 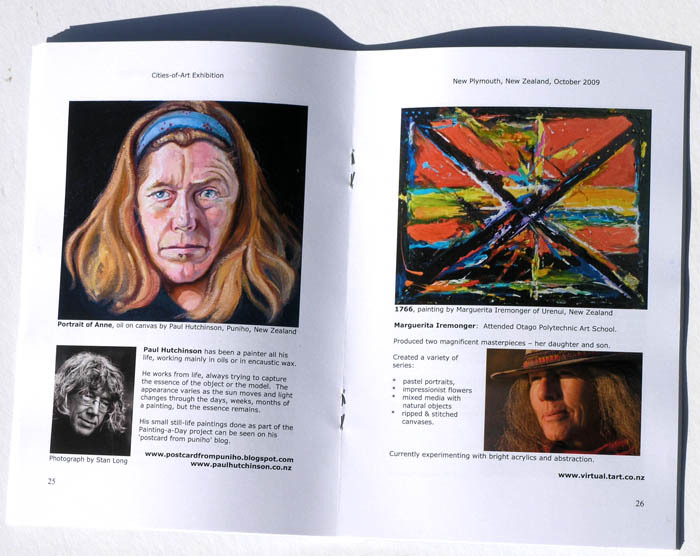 The catalogue has one page for each artist, showing one of their artworks. Helen Daniels and Rainer Daniels, both of Canada. Marguerita Iremonger and Paul Hutchinson, both of New Zealand. Raphaelle Pia and Pierre Pitrou, both of France. A 40-page A5-sized booklet detailing all the etiquette and protocol you need. Front and back covers of each of the calfskin-covered books. Click to see enlargements. 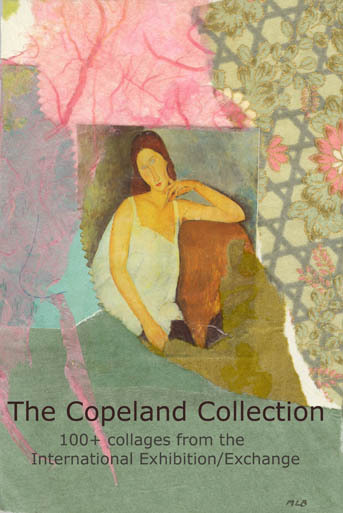 Words by Karen McDell, collages by Dale Copeland. A tale of a battle against anorexia, a battle for life. Limited edition of 5 copies. Handbound in calfskin, printed on 300gsm watercolour paper, endpapers of harakeke paper. 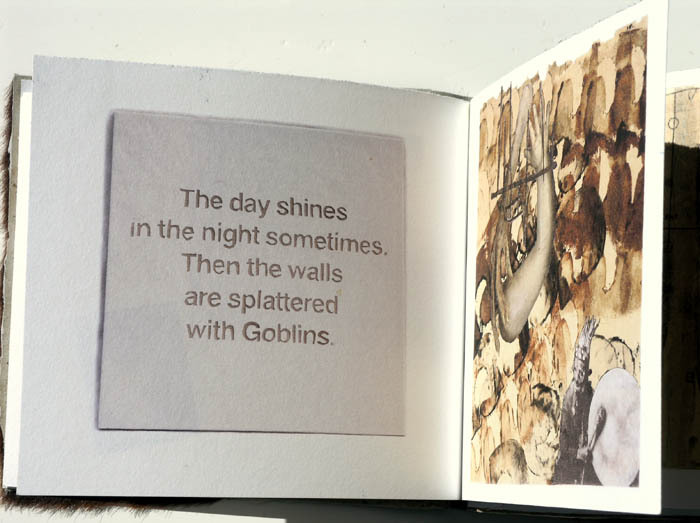 Hand bound in black leather, limited edition of 26, A to Z.
Click on image to see details of the book. 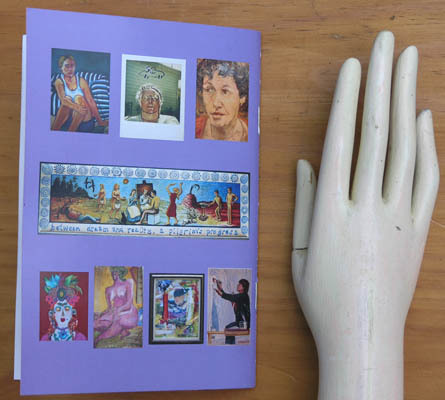 Hand bound, illustrated poem by Dale Copeland, on turning 50. Click on image to read poem & see details of the book. Limited edition of 5 copies. Handbound in soft leather, printed on 300gsm watercolour paper, endpapers of harakeke paper. $100 + postage 1/5 , 2/5 , 3/5 , 4/5 , 5/5 Sorry, now all sold. covered with striped linen, flaxpaper endpapers. 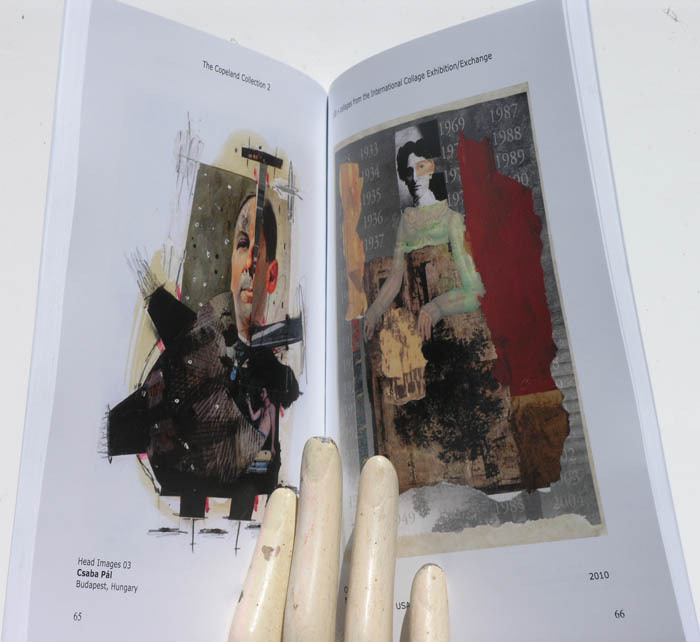 Illustrated with 36 b/w photographs of assemblages. Click on the image for more on this book, including a sample page of the text and images of the most recent covers.